Telomelysin (OBP-301) - Pipeline | Oncolys BioPharma Inc.
Telomelysin is a gene-modified oncolytic adenovirus in which selectively replicate in cancer cells by introducing human telomerase reverse transcriptase (hTERT) promotor. 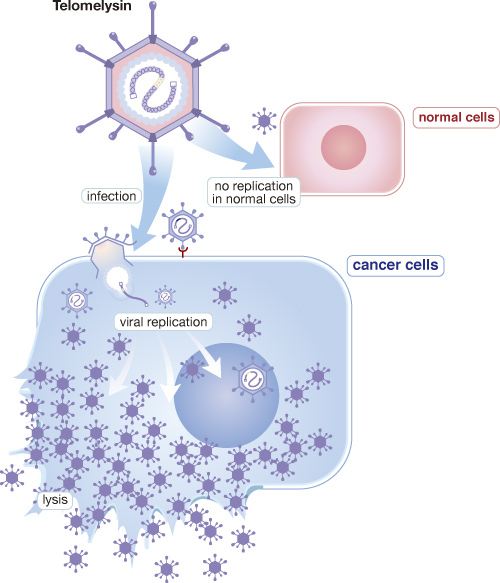 Oncolytic adenovirus has much potential for cancer immunotherapy because its viral replication is highly immunogenic, and oncolysis induced by such virus releases tumor antigen and provides costimulatory danger signals. From the result of phase 1 clinical study in the US, OBP-301 showed abscopal effect, which non-injected tumor as well as injected tumor was regressed in melanoma patients after single injection into one single tumor and found that not only increasing infiltration of CD8 and antigen presenting cells but diminishing Treg cells in injected tumor site. 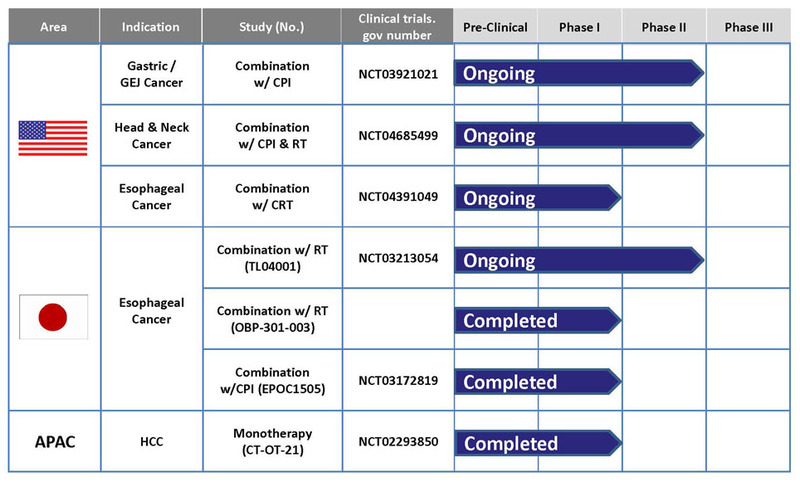 Oncolys has been conducting phase1 clinical study of Telomelysin for hepatocellular carcinoma in Korea and Taiwan and phase 2 clinical study for melanoma in the US. We will also soon initiate phase 2 study for esophageal cancer in combination with radiation, and another study for esophageal cancer in combination with a check-point inhibitor in Japan. We further have a plan to initiate two clinical studies. One is esophageal study in combination with chemo radiation in the US We anticipate the first patient enrollment in 2Q 2019. The other one is gastroesophageal cancer study in combination with check-point inhibitor, which will be initiated in 4Q, 2018.